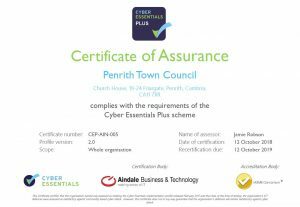 Penrith Town Council is fully committed to full compliance with the requirements of the General Data Protection Regulation. The Council will therefore follow procedures which aim to ensure that all employees, elected Members, contractors, consultants, partners or other servants or agents of the Council (collectively known as data users) who have access to any personal data held by or on behalf of the Council are fully aware of and abide by their duties under the General Data Protection Regulation. The information you provide (personal information such as name, address, email address, phone number) will be processed and stored securely so that it is possible to contact you and respond to your correspondence, advise, provide information, send invoices and receipts relating to Council service provision. Your personal information will not be shared with any third party and we do not keep information for longer than is necessary.